The Stunt Factory was established in 2004. After the opportunity arose, the business was taken over by Mike Garguilo in 2007. We are currently owned and operated by Mike and his wife Melanie along with a few employees in our shop in South West Florida. The Stunt Factory Team is a group of riders and enthusiasts. We are not a large corporation that is hungry for sales. We are dedicated to getting our customers bike's set up just the way they want them. 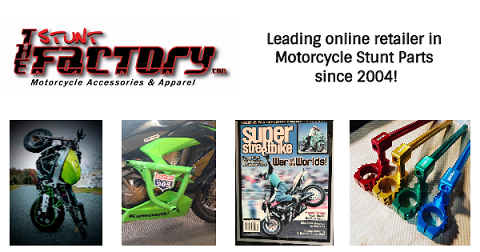 We specialize in stunting parts but are authorized dealers of many top names in the motorcycle industry. Wether you are stunt riding, drag racing, road racing, or street riding, we have a broad selection of street bike parts for you at competitive prices. The Stunt Factory is a legal U.S. Authorized Dealer of Vortex Racing, Driven Racing, Sick Innovations, Racing 905, New Breed, Thrust Company, HEL Lines, EK Chains, RK Chains, Kevtek Stunt Parts, ImpakTech, Spiegler USA, LSL, ABM, Brembo, EBC, Magura, Hohey Designs, WoodCraft, GPR, and more. The Stunt Factory is not just a warehouse full of parts. We are not Amazon Prime where after you place an order it is at your door step 2 days later. We are a CUSTOM motorcycle shop operating out of a small 600 square foot shop. A large percentage of our orders are made in-shop by our suppliers. All of our armor (crash cages, sub cages, 12/round bars) are custom built from scratch for your specific model and generally take 4 weeks to ship. Hand-brake kits, Thrust Company Sprockets, HEL lines, Clip-Ons, Handle Bar Kits, and many more of our parts are made specifically in the shop for your bike upon ordering. Any time a custom color is ordered - for example - a Red Thrust sprocket, a Purple HEL line w/black fitting, a hand-brake kit with a Blue dominator cap... etc.. All of these go through our manufacturing and anodizing process so we can make YOUR bike look exactly how you want it! Please allow us sufficient time to prepare these orders and ship them from the shop. We also drop-ship from time to time if a manufacturer has a product in-stock and ready to ship. In striving for 100% customer satisfaction, we are always available during business hours to answer any questions! As always thank you for choosing to be a part of The Stunt Factory Team, we appreciate all of our customers! 3. The Stunt Factory may revoke or modify any of the foregoing rights at any time. © THE STUNT FACTORY 2004 ALL RIGHTS RESERVED. Errors in the description, photography, or typographical errors are subject to correction at the sole discretion of THE STUNT FACTORY. Nothing on this web site will be construed as conferring any license of The Stunt Factory's rights or any third party rights. Although the information is provided on this server to anyone, we retain the copyright on all text and graphic images. This means you may not distribute the text or graphics to others without the express written permission of The Stunt Factory, or modify or re-use the text or graphics without the express written permission of The Stunt Factory. It is expressly forbidden to use either The Stunt Factory's URL, meta-tags, or other embedded web site information to effect any "matchmaker" advertising by third parties, or to act as a conduit for others to effect the same result. You may print copies of the information for your own personal use. The Stunt Factory also reserves all other rights, including the right to make changes or corrections at any time without notice. You are prohibited from posting on this web site or transmitting to this web site any unlawful, threatening, libelous, defamatory, obscene, scandalous, inflammatory, pornographic, objectionable or profane material or any materials that could constitute or encourage conduct that would be considered a criminal offense, give rise to civil liability or otherwise violate any law. The Stunt Factory will fully cooperate with law enforcement authorities or court orders requesting or directing The Stunt Factory to disclose the identity of or help identify anyone posting any such information or materials on this web site. The Stunt Factory makes no commitment to update the information provided herein. The information, text, graphics, and links on this web site are provided by The Stunt Factory as a convenience to its customers. This web site may contain content not generated by The Stunt Factory and The Stunt Factory is not responsible for any third-party content. The name of The Stunt Factory or the The Stunt Factory logos and trademarks may not be used in advertising or publicity pertaining to distribution of the information on or linked to this web site or any other server or "hot-linked" sites without specific, written prior permission. The Stunt Factory makes no representation or warranties about the accuracy, currency, completeness, or suitability of the information provided on this web site and will not be liable for any use of this information for any purpose. The information on this web site could contain technical inaccuracies or typographical errors, and information may be changed, updated, and deleted without notice. The Stunt Factory may make improvements and/or changes in the products and/or the programs described on this web site at any time. The material provided on this web site is protected by law, including, but not limited to, United States copyright law, trademark law, and international treaties. This web site is controlled and operated by The Stunt Factory in West Palm Beach, Florida, United States of America. The Stunt Factory makes no representation that materials on this web site are appropriate or available for use in other locations. Those who choose to access this site from other locations do so on their own initiative and are responsible for compliance with local laws, if and to the extent applicable. THE STUNT FACTORY DISCLAIMS ALL WARRANTIES WITH REGARD TO THE INFORMATION PROVIDED ON THIS WEB SITE OR OTHER SITES "HOT LINKED" TO THIS SITE, INCLUDING ALL EXPRESS OR IMPLIED WARRANTIES OF MERCHANTABILITY OR FITNESS FOR A PARTICULAR PURPOSE. IN NO EVENT WILL THE STUNT FACTORY BE LIABLE FOR ANY DIRECT, INCIDENTAL, SPECIAL, INDIRECT, CONSEQUENTIAL DAMAGES, OR PUNITIVE DAMAGES WHATSOEVER RESULTING FROM LOSS OF USE, DATA, BUSINESS INTERRUPTION, SALES, OR PROFITS, WHETHER IN A CONTRACT, NEGLIGENCE, OR OTHER TORTIOUS ACTION, ARISING OUT OF ACCESS TO, USE OF, OR IN CONNECTION WITH THE USE, INABILITY TO USE, ACCURACY, SUITABILITY, OR PERFORMANCE OF THIS INFORMATION, EVEN IF THE STUNT FACTORY IS EXPRESSLY ADVISED ABOUT THE POSSIBILITY OF SUCH DAMAGES. SOME JURISDICTIONS DO NOT ALLOW THE EXCLUSION OF IMPLIED WARRANTIES, SO THE ABOVE EXCLUSION MAY NOT APPLY TO YOU. ANY CLAIM RELATED TO THE INFORMATION ON THIS WEB SITE WILL BE GOVERNED BY THE LAWS OF NEW YORK WITHOUT REGARD TO CONFLICTS OF LAW RULES. IN THE EVENT OF ANY DISPUTE REGARDING THIS WEB SITE, THE PARTIES IRREVOCABLY CONSENT TO EXCLUSIVE PERSONAL JURISDICTION AND VENUE IN THE COURTS IN SUMMIT COUNTY IN THE STATE OF FLORIDA, IN CONNECTION WITH ANY DISPUTE ARISING UNDER A STATE CLAIM INVOLVING THIS AGREEMENT OR WEB SITE AND TO THE FEDERAL DISTRICT COURTS, IN CONNECTION WITH ANY DISPUTE ARISING UNDER A FEDERAL CLAIM INVOLVING THIS AGREEMENT OR WEB SITE.